Over 50 percent of all the shoes sold in Germany originate from China, followed by Vietnam, India, and Indonesia. The average production cost for a pair of shoes made in these Far Eastern factories lies between 5.51 and 14.20 euro. Although these shoes are usually made of synthetic materials, low-quality leather shoes are also imported on the cheap. Thanks to correspondingly low retail prices, consumer interest in these shoes is high. At the moment of purchase, it’s easy for the consumer to turn a blind eye to the dubious provenance of shoe materials, as well as to terrible shoe manufacturing conditions. Appeals to consumer conscience don’t typically register until disturbing images of collapsing factories in Bangladesh, Cambodia, or Pakistan are televised, where many thousands of workers have paid with their lives. The viewer learns that in these countries, masses of low-wage employees prepare fashion merchandise for the Western world under highly exploitative conditions, while Indian and Bangladeshi tanneries commit unforgiveable crimes against the natural environment. The goal of the Western purchaser is clear: cutting costs, at all costs. All of this can be prevented by conscious consumption. Certain brands already distance themselves from exploitative production conditions, making sure to consider the potential ecological ramifications of the manufacturing processes they use. SHOEPASSION.com operates like any purveyor of luxury goods; we concentrate on the very best of the best. What’s more, everything revolves around our passion for the cultural value of shoes. We give the fruits of a centuries-old traditional craft a new home in the digital age. We’ve drafted moral and ethical principals that we hold dear, and which we use to dictate our company culture. Our shoe designs are sketched in our Berlin headquarters and brought to life in select European factories. We don’t make any compromises when it comes to the materials we choose. The hides used to make our calfskin shoes come from France, are tanned in Germany, using a gentle and non-toxic method that isn’t harmful to workers or the environment, and finally made into beautiful shoes by master shoemakers in Spain. We personally know the people who make our shoes; we know exactly where the leather we use comes from, and we don’t coordinate our shoe deliveries from anonymous logistics centres—we’re responsible for all shipments to our customers. Unlike certain large, well-known mail-order fashion retailers, we treat all of our employees with respect—nobody at our company has to stay on their feet for ten hours at a stretch, earning less than the minimum wage. At SHOEPASSION.com, everybody is treated the same: well. From the production stages through to delivery, we work hard to maintain sustainability and transparency. Whether it’s a look behind the scenes at our factory and tannery or reviews from real customers and experts, we have nothing to hide; we present our entire business model in the greatest possible detail. We’re also preoccupied with the pressing issue of »data protection«. To assuage fears of digital monitoring, we host our entire online presence in Germany, where the online security standards are so high that even banks trust them. Our ethical and moral policies are strongly supported by our business structure. Unlike many other startups, SHOEPASSION.com is an owner-managed company. Although it’s extremely common for Internet companies to accept investment capital, we opt for sustainability instead. Our two founders insist on taking charge of their own business. Both are huge shoe fans, and they aren’t concerned with hyping an online shop, only to quickly sell it to the highest bidder—as in all things, we prefer sustainable practices. 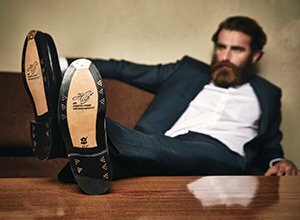 Traditional, quality shoes presented 21st-century-style. SHOEPASSION.com – one step ahead!